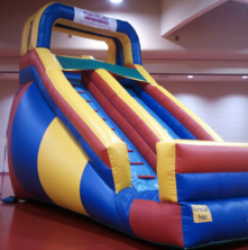 This is the big super slide your event needs. This slide will go higher than any slide we have. Great for special events and large parties. Kids can enjoy and parents can take the younger kids on the slide for family fun. Price: $329.00 per 7 / hrs. Price: $329.00 per 3 / hrs. Price: $329.00 per 4 / hrs.